David Robertson Ross was convener of the Society of William Wallace and a passionate promoter of the memory and contemporary relevance of his hero, who defeated Edward I’s army at the Battle of Stirling in 1297. Ross attended school in East Kilbride, where he recalled having lessons about Magna Carta “drummed” into him, but learnt little about Scottish history. Like many schoolboys, however, he discovered and loved the Scottish historical novels of Nigel Tranter, whose books about Robert the Bruce and Wallace, said Ross, “were like a door opening to me. They were about ‘my’ history, ‘my’ people, and were set in places that, even at that tender age, I knew well. ”At 17, the young enthusiast for Scottish history began touring his native land on a motorcycle “acquiring knowledge of Scotland, its history and geography, just enjoying this little scrap of mountain and moorland on the edge of Europe. It never really occurred to me that I had absorbed a wealth of knowledge,” he said. Inspired, however, by a remark that someone should write a book on Scotland’s Wallace sites, Ross wrote On the Trail of William Wallace, published by Luath Press in 1998. The passionate approach of the “Biker Writer”, as he became dubbed, proved popular and other books followed: On the Trail of Robert the Bruce; On the Trail of Bonnie Prince Charlie; A Passion for Scotland; Desire Lines: a Scottish Odyssey; For Freedom; On the Trail of Scotland’s History; and James the Good: the Black Douglas. 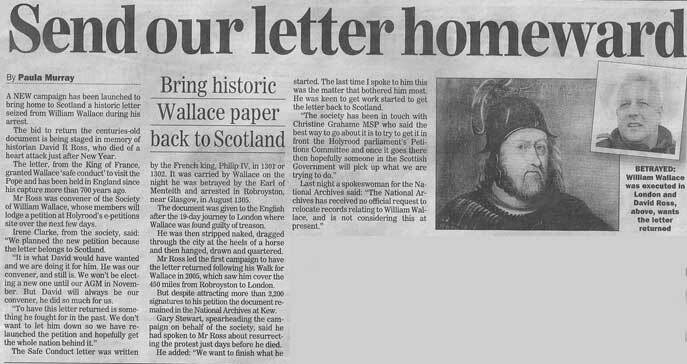 To commemorate the 700th anniversary of Wallace’s capture and execution, in August 2005 Ross undertook a solitary “Walk for Wallace”, re-enacting Wallace’s journey in captivity from Scotland to London. After Ross arrived in London, a service with a coffin containing the “spirit” of Wallace was held at St Bartholomew’s Church in the City. The SNP leader, Alex Salmond, was present and declared that from “now to eternity on August 23 the saltire should fly at half-mast over every public building in Scotland”. Ross proclaimed that Wallace himself was perhaps present at the service. “Can you feel his presence?” he asked. The coffin, also containing prayers, poems and pledges of allegiance deposited by the assembled patriots, was taken from the church by tearful bearers, and, led by Ross, the procession moved slowly down Fleet Street, as bemused Londoners looked on. Ross was a familiar speaker at festivals and the Highland Games, and was frequently called upon by the media to give an opinion on Wallace (especially when anyone expressed reservations about Wallace as a hero) but remained unknown to most Scots. 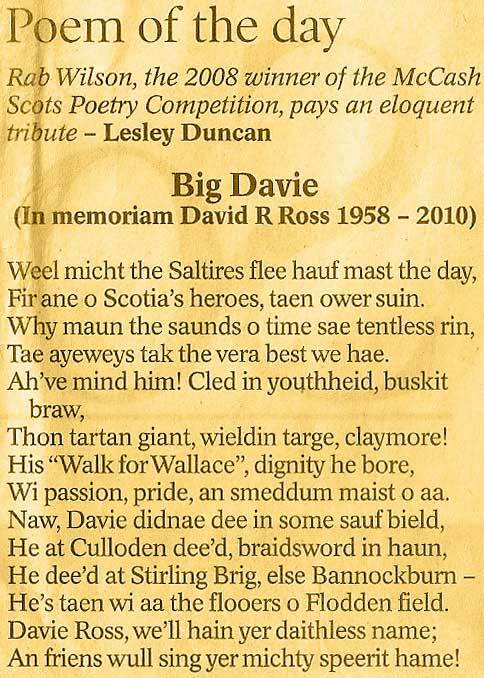 In the world of US-Scottish cultural societies, however, Ross’s imposing figure — he was 6ft 5in tall and well built — was a lauded presence on the speakers’ platforms at Scottish-themed events. Mark Twain famously blamed Walter Scott’s novels for causing the American Civil War by convincing Southerners that they were descended from noble, independent-minded Scottish clanspeople. Thanks in part to Ross, whose portrayal of Wallace was largely indistinguishable from Mel Gibson’s ferociously anti-English depiction of him in Braveheart (1995), Scottish culture became even more popular in the US. In 2009 Ross contributed to the making of the Blu-ray edition of Braveheart. To everyone’s surprise, Gibson announced at the launch of the edition that he had come to realise that the historical Wallace was in fact a “monster” with little in common with the Braveheart version. Ross was married and divorced twice and is survived by a daughter. David Robertson Ross, who has died aged 51 of a heart attack, was an author and Scots historian whose career had its genesis in English history and motorcycles. Having had the Norman Conquest, the Magna Carta and the English Wars of the Roses drummed into him at school, he realised he remembered little of learning about Scotland’s rich history. When he discovered Nigel Tranter’s novels and motorbikes as a teenager, his desire was fired to visit the places where the great deeds that shaped his nation occurred. On a whim, he began to write, by memory, William Wallace’s life story, interspersed with directions to find the significant Wallace sites – and his career as the “biker historian” began. A friendy, charismatic and enthusiastic character, Mr Ross was regarded as a giant of a man although this had less to do with his 6ft 5in stature than his personality. “He could talk to a crowd of people who’d never had any interest in history and have them hanging on his every word,” said his production editor Leila Cruickshank. Born in Giffnock, Renfrewshire, he moved aged five to East Kilbride which remained his home until his death. Educated at the town’s Halfmerk Primary School and East Kilbride High School, he left in 1974 with six O grades. He devoured everything he could find on Scotland’s history and, aged 17, bought his first motorbike and began visiting the places of which he had read. It did not occur to him that he had garnered a wealth of know ledge on the way and, when friends suggested he should commit it to paper, he initially thought no-one would be interested. He began writing after attending a lecture and hearing speaker, Dr Elspeth King, suggest someone write a book listing Scotland’s Wallace-related sites. He recalled: “I was sitting in the audience thinking, ‘I could do that!’ ” He started the next day with the story of Wallace’s life, interspersed it with modern directions to the relevant spots. He took it to Edinburgh’s Luath Press and On the Trail of William Wallace was published, entering the top 10 best sellers list in Scotland in its first week. Mr Ross, who was convener of the Society of William Wallace, followed with similar books On the Trail of Robert the Bruce and Bonnie Prince Charlie, A Passion For Scotland, charting the burial places of all the rulers of Scotland, and Desire Lines, a journey round lesser known places in Scotland. In 2005, the 700th anniversary of Wallace’s capture near Glasgow and journey to execution in London, Mr Ross repeated that last journey, walking the 450 miles recorded by a television company in the DVD Walk for Wallace, and accompanied over the last few miles by hundreds of followers. His sixth book, For Freedom!, covered Wallace’s last month, encompassing the experiences of Ross and others’ 700th anniversary commemorations. His latest book, James the Good: The Black Douglas, was based on research he’d undertaken that was previously unknown to historians. Mr Ross, who was divorced and had a daughter, Kimberly, born in 1987, was involved in making many television programmes at home and abroad. He also contributed to magazines and appeared at many events here and abroad, including Highland Games and Scottish festivals in North America. 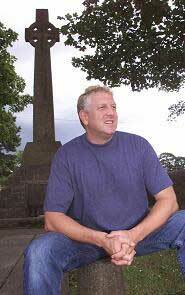 Author and historian; Born February 28,1958; Died January 2, 2010. 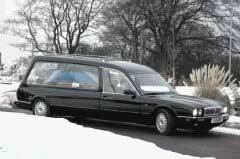 HIS coffin draped in the Saltire, author and historian David Ross was carried on his last journey by six kilted friends to the tune of ‘Scots Wha Hae’ on the bagpipes. Hundreds of mourners travelled from far and wide to pay their respects, so many that people were standing in the aisles and entrance hall to hear tributes led by David’s friends Humanist celebrant Jim McQuiston and well-known Scottish singer/songwriter Ted Christopher. And since his sudden and tragic death as the result of a heart attack at his home in the Village in East Kilbride on Saturday, January 2, at the age of just 51, thousands of people from every corner of the globe have taken the time to pay tribute to a man the whole of Scotland has good reason to mourn. David, with his passion for Scotland, was a wonderful ambassador for his beloved country. So it was not surprising therefore that among the tributes was one from Scotland’s First Minister Alex Salmond, who described David as “a tremendous enthusiast” for all things Scottish and, in particular, for the memory of William Wallace. Through his books – the ninth of which he completed shortly before his death – his programmes for television and radio, his talks and his public appearances both here in Scotland and further afield, notably in the United States and Canada, David – in the words of his friends – inspired “thousands of people to acknowledge who we are as a nation”. Born in Giffnock on February 28 1958, David’s family moved to East Kilbride when he was five and he attended Halfmerke Primary and East Kilbride High School. One of his favourite subjects was history but he was frustrated at the fact it was mainly English history. As a teenager he was inspired by the novels of Nigel Tranter to learn more about Scotland’s history and, at 17, he bought his first motorcycle and started to visit all the places he had read about. His first book, entitled “On the trail of William Wallace” was published in 1999 and within a week was on the top ten bestsellers list in Scotland. From then on David was regularly in the headlines travelling extensively to appear at meetings, highland gatherings and other events throughout the world. An accomplished musician, keep fit enthusiast, friend and confidant, and for his good humour, sense of fun and fantastic knowledge, there are many aspects of David’s character for which he will be fondly remembered. He was involved, too, in a number of organisations, notably as convener of the Society of William Wallace. And it is perhaps his Walk for Wallace for which David will be best remembered. In August 2005 he walked the 450 miles from the spot where Wallace was captured in 1305 to his place of execution in London. It was a journey closely followed by Scots patriots all over the world, including Sir Sean Connery, who telephoned David several times during the walk. The funeral service David organised at St Bartholomew’s Church at Smithfield near the site where Wallace was executed was attended by hundreds of people, including Alex Salmond, and broadcast worldwide. Afterwards David brought home a coffin containing Wallace’s “spiritual remains” in the form of letters from Scots patriots, to Lanark for burial. ‘I’m Coming Home’, a song written by Ted Christopher for that service was one of two songs played by Ted at David’s funeral, the other being ‘Caledonia’. Perhaps the only thing he loved more, was his daughter Kimberly and our heartfelt condolences go out to her and their extended family. As David’s friends said he had so much more he wanted to do, so many plans and they have pledged to try and carry his dreams forward. 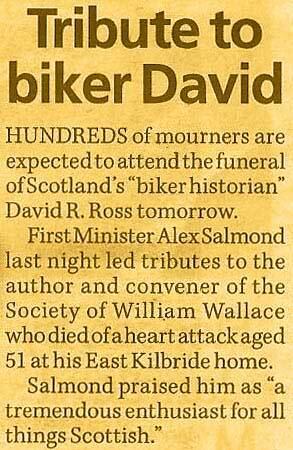 DAVID R Ross, who has died suddenly of a heart attacked aged 51, became known as "the biker historian" after writing a string of highly acclaimed books on Scottish history, notably about William Wallace. For his research, he travelled his native land in full black leathers on his black Kawasaki ZZR motorcycle. At 6ft 5in tall, and in the kilt when not in leathers, he was often told he'd have made a far better Wallace in Braveheart than "that wee Aussie". Nevertheless, Ross respected Mel Gibson's 1995 movie and believed it "raised the profile of Wallace and pricked the Scottish psyche to a great extent. There had been nothing like this in Scotland since 1978 when we were going to win the World Cup in Argentina with Ally's Army," he said. In 2005, the 700th anniversary of Wallace's execution for treason, Ross gained domestic and international prominence when he set off on a Walk for Wallace, retracing his hero's final trip from Robroyston, Glasgow, where he had been betrayed and captured, to Smithfield in London, where he was hanged, drawn and quartered. Along the 450-mile way, "Big Davy" was cheered by Scots and hundreds joined him for the final six-mile hike into London. There, he presided over a symbolic funeral service for Wallace at the St Bartholomew the Great church in Smithfield, close to the spot where he died. Ross's dream, was to bring the Scottish patriot "home" for a symbolic funeral he had been denied 700 years earlier when his body was cut into pieces to be displayed throughout the land as a warning to other would-be independence fighters. From London, Ross and his supporters carried a coffin they said was carrying Wallace's spirit, packed with letters, poems and good wishes from Scots. On their return to Scotland, they held a torchlit parade in Lanark and buried the coffin there, at St Kentigern's church. David Robertson Ross was born in Giffnock in 1958. His family moved to East Kilbride when he was five and he attended Halfmerke Primary and East Kilbride High School, leaving at 16. He would live in East Kilbride for the rest of his life. "At school, I was taught history from a 'British' perspective," he once wrote, "in fact, an almost-wholly English perspective – the Norman Conquest, 1066 and all that. "At 14 or 15, I discovered the novels of Nigel Tranter, first the Bruce trilogy, then the Wallace. These books were like doors opening to me. They were about my history, my people, and were set in places that, even at that tender age, I knew passing well. These led on to me devouring everything I could find in print that spoke about the colourful, proud, sometimes tragic history of Scotland. "At the age of 17, I purchased my first motorcycle and started to visit all the places I had been reading about, where the great deeds that shaped my nation had occurred. All my spare time was spent acquiring knowledge of Scotland, its history, geography, just enjoying the scenery of this little scrap of mountain and moorland on the edge of Europe." One day, he was at a lecture in Glasgow given by the director of the Stirling Smith Art Gallery and Museum in Stirling, Dr Elspeth King, who happened to mention that somebody should write a book listing the many Wallace-related sites in Scotland. Ross thought: "I could do that," and the next day set off on his motorbike. The result was his first book, On the Trail of William Wallace, which became a best-seller in Scotland. His later books, all published by Luath Press, included On the Trail of Robert the Bruce, On the Trail of Bonnie Prince Charlie, A Passion for Scotland, Desire Lines: A Scottish Odyssey, For Freedom and On the Trail of Scotland's History. His last book was James the Good: The Black Douglas, about the Scottish knight and fighter for independence who followed a generation behind Wallace. He said: "I was not trying to blind anyone with detail, or go into heavy academic depth. I wrote for everyday Scots and others interested in our history." When few if any would. Ross was serving convener of the Society of William Wallace, set up to preserve the memory of the Scottish patriot, which meets in Elderslie, Renfrewshire, where Wallace was born. Commemorating Ross on its website yesterday, the society wrote: "If there's a heaven, David will be up there right now, sitting with William Wallace, Robert the Bruce, the Douglas and all the other great Scottish patriots, and he more than deserves his seat at that table." David Ross was twice married and divorced. He is survived by his 22-year-old daughter from his first marriage. Born: 28 February, 1958, in Giffnock, Renfrewshire. Died: 2 January, 2010, in East Kilbride, aged 51. A historian famed for marking the 700th anniversary of the death of William Wallace by marching the route of his journey to execution has died. David Ross, 51, a writer and convenor of the Society of William Wallace suffered a heart attack at his home in East Kilbride. He was known as the "biker historian" as he visited historic sites across Scotland on his motorcycle. First Minister Alex Salmond is among those who have paid tribute to Mr Ross. A message on the historian's official website said "Scotland has lost one of her finest sons." It added: "He was a giant of a man in so many more ways than his physical stature. "No man loved his country more and he made sure everybody knew it with an incredible passion for both its history and its future. 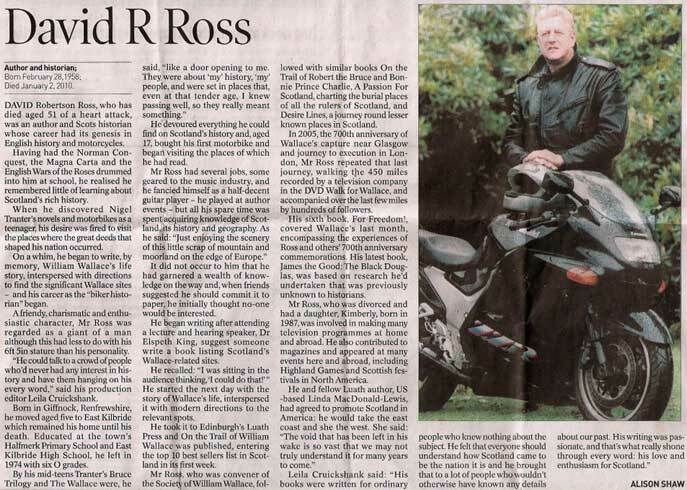 "Mr Ross released his first book, called On the Trail of William Wallace, in 1999. He went on to write other books about Robert the Bruce, James "The Black Douglas" and other Scottish heroes. 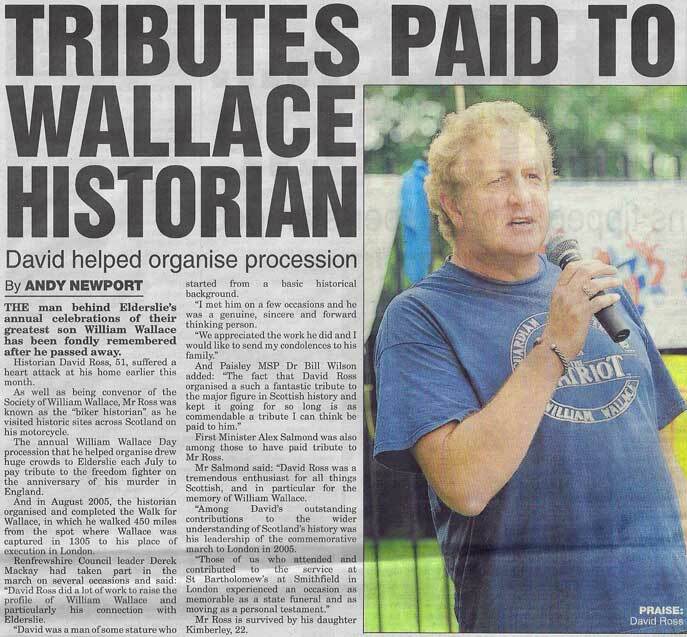 In August 2005 the historian organised and completed the Walk for Wallace, in which he walked 450 miles from the spot where Wallace was captured in 1305 to his place of execution in London. He then held a funeral service for Wallace, attended by hundreds of Scots and later wrote a book "For Freedom! ", charting the last month of Wallace's life. Mr Salmond said: "David Ross was a tremendous enthusiast for all things Scottish, and in particular for the memory of William Wallace. "Among David's outstanding contributions to the wider understanding of Scotland's history was his leadership of the commemorative march to London in 2005. "Those of us who attended and contributed to the service at St Bartholomew's at Smithfield in London experienced an occasion as memorable as a state funeral and as moving as a personal testament." Mr Ross is survived by his daughter Kimberley, 22.